On April 18 poet francine j. harris, author of play dead and Here is the Sweet Hand (forthcoming from Farrar, Straus & Giroux) and the 2018/2019 Rona Jaffe Foundation Fellow at the Cullman Center for Scholars and Writers at the New York Public Library, will lead a three hour poetry Master Class. After registering, participants will receive an email prompting them to submit writing to be workshopped. In advance of the meeting, harris will review the submissions, and select one piece per participant to workshop together in class. francine j. harris is the author of play dead, winner of the Lambda Literary and Audre Lorde Awards and was a finalist for the Hurston/Wright Legacy Award. Her third collection, Here is the Sweet Hand, is forthcoming on Farrar, Straus & Giroux. 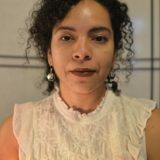 Originally from Detroit, she has received fellowship from the National Endowment for the Arts, is a Cave Canem poet, and is the 2018/2019 Rona Jaffe Foundation Fellow at the Cullman Center for Scholars and Writers at the New York Public Library.